Joyride Cycles, online at Joyride-Cycles.com, is the exclusive Boise, Idaho bicycle dealer for MSC Bikes, LOOK Cycles, Transition, Vassago, Jamis, Eastern, Shimano, SRAM, Rock Shox, Fox, Five Ten, Bell, Giro, Hammer Nutrition, Clif, FRS, Accell, and much more. 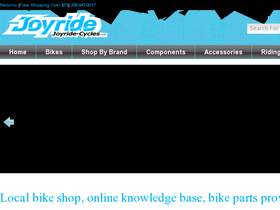 Find the ever-growing bicycle catalog, component catalog, accessory catalog, and nutrition catalog from Joyride Cycles on their website. Save on your Joyride-Cycles.com purchase with Joyride Cycles discounts, Joyride cycles coupons and Joyride Cycles promotions found on 58Coupons.com. Enjoy free shipping from Joyride-Cycles.com when you spend $100 or more. (Oversized packages excluded). Click link to get started. Enjoy up to 35% or more off Bell Helmets from Joyride-Cycles.com. Click link to get started. Discount of 25% off Giro bicycle helmets from Joyride Cycles. Click link to get started. Save big on sale gear at Joyride-Cycles.com. Right now select 2009 models are discounted by up to 20%! Click link. Shop the Disc Brake Sale to get Avid, Shimano and Hayes for 10 - 15% off at Joyride Cycles. Click link to enjoy this limited time offer.